Book direct any time before the end of June 2019 for 3 or more nights and receive either an OS Tour map of North and mid Wales or an OS Explorer map of Snowdonia OL17 (whilst stocks last). 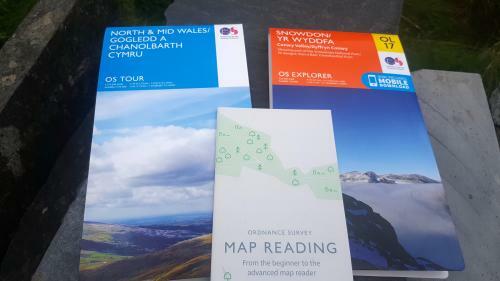 If your map reading skills are not uptodate we also have copies of Map Reading from Beginner to Advanced too. Book for 5 nights and receive both maps! Just mention "OS map" in your booking special requests field and we will reserve one for you. In line with other hotels and B&Bs in Betws-Y-Coed we operate a 2 week cancellation policy.Cancellations can be made up to 2 weeks before arrival at which point full payment will be taken from the registered card and is non-refundable.If payment cannot be taken we will attempt to contact to correct the issue. If we are unable to take payment within 24 hoursthe booking will be cancelled. As with any holiday you are advised to take out travel insurance. By booking a room or rooms with ourselves you are agreeing to abide by our Terms & Conditions detailed on our website www.bodgwynedd.com/terms. We ask that you read them prior to arrival.